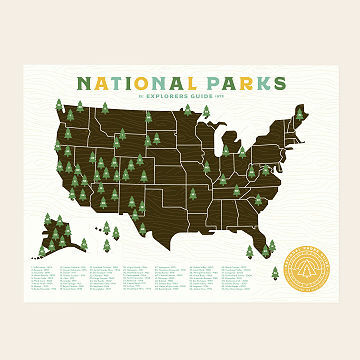 Mark trips to the National Parks with this hand silk-screen map, perfect for explorers and geography buffs. This is the perfect way to chart your adventures as you seek out some of our country's greatest treasures—its National Parks. Whenever you hit the road to explore iconic vistas or hidden gems, mark your discoveries on the map with the included, numbered tree stickers. The numbers correspond to the key at the bottom, which lists all 59 current National Parks, and dares you to plan a road trip just to catch the ones you've missed. Hand silk-screened, the design is just the right balance of "vintage textbook" and "classic adventure movie." Complete your evergreen print with birch poster frames handcrafted in Chicago. The contemporary, magnetic panels attach with a safe and secure clamp. Print designed in Brooklyn, New York. Printed in Kansas. Take a studio tour to see where Seth and Maddy's National Parks Map comes to life! Both art and frame should be protected from moisture and from prolonged, direct sunlight. Print arrives rolled in tube with one sheet of tree stickers. I bought this thinking it'd look a little nicer than it does. If it was less expensive then the product would be great. My sister's family loves to camp and have started to venture out to visit National Parks across the US. When I saw this, I knew it would be a good gift for them and help them to track their adventures. It was a true win, my brother-in-law loved it. This will help them plan their next adventure. What a clever way to track the travels through the national parks and to track and display the accomplishments! Price doesn't match quality (or lack of quality). Inferior look and feel. Not as pictured. Bought this as Christmas gift for sis & bilaw. Both are retired and have a goal of visiting every state and also every National Park. They already have a map where they are marking all the states they have visited. I thought the National Park map would be a nice addition. The map is pre-marked w trees showing locations of all the parks. Once visited, you add one of the tree stickers provided to the pre-printed tree on the map. I think they'll really like it. Can't wait to hang it but had trouble finding the frame online. This was very disappointing. It is not a silkscreen, but inexpensive poster material and in no way justifies the price. It also does not come with the frame, as pictured. I would be embarrassed to give this as a gift to good friends. It is going back. I wasn't paying extra money for the frame they provided, I went out and bought my own and it looks very nice. My boyfriend loves to travel and he will be able to keep track of all the parks he has been to!